You guys! Today, I’m bringing you amazing peanut butter pie. The creamy, dreamy, insanely rich peanut butter pie from my youth. 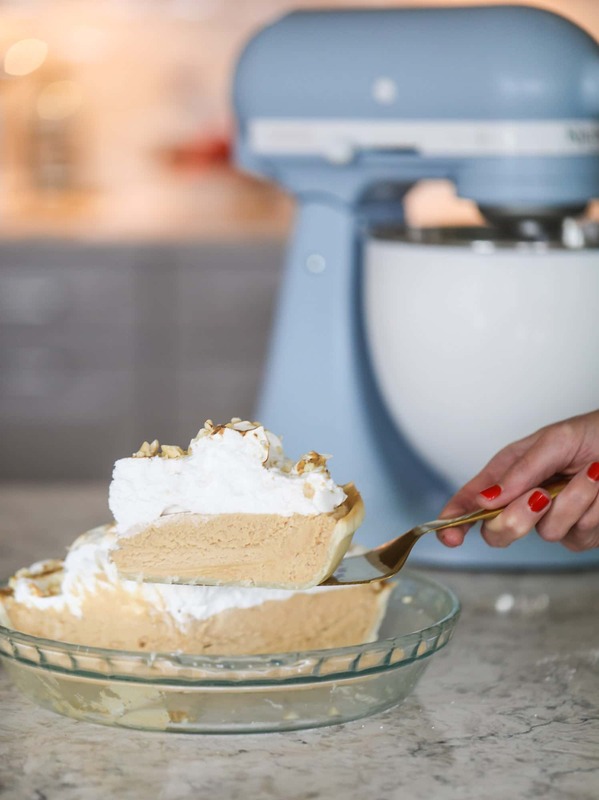 And I’m going to tell you about this magical peanut butter pie that I got to make with this absolutely STUNNING KitchenAid 100 Year Limited Edition Stand Mixer. I’m so excited to partner with KitchenAid as they begin their 100 Year Celebration. 100 freaking years! How amazing is that? You guys probably remember my very first KitchenAid mixer here on the blog. It was the one that I got for my wedding and I absolutely adored it. I had never been so excited as I was to register for that KitchenAid mixer! It was such a lovely light pink and Mother Lovett actually bought it for me. As KitchenAid celebrates this major milestone, I can’t help but be my crazy nostalgic self and think about my own moments of making in the kitchen, going all the way back to when I was a kid who could barely reach the counter. The times when both my mom and grandma broke out their mixers? Oooooh I knew something good was about to go down. Even the sound of my stand mixer is like instant nostalgia. Baking with Mother Lovett is one of the most vivid memories I have. The fact that I started my entire blog based on memories of her and that I’m currently working on my own tenth year of blogging? It makes this entire celebration even more special! It’s no secret that Mother Lovett was the queen of all things layer cakes and pies. It still blows my mind that she baked a pie almost every single weekend (she always baked multiple pies each weekend when my mom was growing up!) and that it takes me two days to get the courage to bake one. Ha. A few weeks ago Lacy and I were talking about Mother Lovett and somehow we landed on her peanut butter pie. It’s the pie that both of us remember the most, even though she made so many different varieties. Mother Lovett was such a huge fruit pie lover – it was always apple or cherry or lemon merengue. That’s what my parents liked too; that’s what was always coming out of her kitchen. And then one day, when we went to her house, she had made a peanut butter pie. This peanut butter pie was unreal. It wasn’t like the frozen peanut butter pies made today, it didn’t have frozen whipped topping mixed in or anything. And it was in a regular pastry pie crust. It was dense and silky and wonderful. It tasted like the inside of a peanut butter cup –and at that time, it was unlike any homemade dessert I had ever tasted!! Lacy and I lost our minds over it. My brothers freaked out over it too. It was SO rich that you only needed a small slice (and trust me, she only gave us a small slice!) to be satisfied. As a kid, this is the moment that pie found a spot on my radar. If pie could taste like the inside of a peanut butter cup? Um, hello, I could eat it every day! Ironically… Mother Lovett never made the peanut butter pie again. Never! Maybe it’s because we were young and couldn’t fully express how much we loved it. I clearly remember her not being interested in it – I think it was more of a test recipe for her, and she didn’t enjoy flavors like that, and my parents and my aunt and uncle probably weren’t into it either. Since her grandkids never really ate the pies she made every weekend, she went back to the favorites the adults loved: her classics, like coconut and pumpkin custard and heck, she would even make mincemeat pie for my grandpa. I mean. How does one choose mincemeat over peanut butter?! This I will never know. Taking matters into my own hands, it was high time that a peanut butter pie came out of my kitchen. I wanted to come up with something super special to celebrate 100 Years of KitchenAid. KitchenAid has been one of my favorite brands my entire life and to be included in such an exciting milestone is a total honor for me. I was inspired by this fabulous celebration to bring this recipe back to life – the peanut butter pie of my youth that haunted my dreams in the best way possible. Of course, I was tempted to use a graham cracker crust (you know, my fave!) but I resisted and used her never-fail pie dough. The filling is rich and creamy and has loads of peanut butter flavor. The topping is her classic whipped meringue that is basically one huge fluffy, shiny, sugary marshmallow. Dreamy! I used the KitchenAid 100 Year Limited Edition Stand Mixer in the new heritage-inspired color, Misty Blue (seriously, how gorgeous is this!?!) and can’t even TELL YOU how beautiful this looks in my kitchen. I know we’ve always talked here on the blog about how the stand mixer is the ultimate kitchen tool and a beautiful décor piece all in one and this special edition mixer is no exception. And this version packs the same kind of powerful motor Mother Lovett relied on to make all her delicious desserts. This peanut butter pie recipe is almost identical to the one that my grandmother made when I was a crust. Flaky pastry crust is what makes this pie different, along with a creamy no-bake peanut butter filling that is rich and decadent! Add the flour, sugar and salt to your KitchenAid Stand Mixer and pulse just until combined. In a small bowl, whisk together the egg, vinegar and water. Add the cold butter pieces into the mixer and beat on low speed until small coarse crumbs remain throughout the flour. Sprinkle the water/egg mixture over the flour and beat again until the dough comes together. Line the crust with a piece of parchment paper. Use pie weights, dried beans or even granulated sugar to fill the crust and push the parchment paper all the way to the edges. Bake the crust for 15 to 20 minutes, until it's set and golden. Remember, this is the only time we are baking the crust, so you want it fully baked! Lift out the parchment and weights and let it cool completely. In the bowl of your KitchenAid stand mixer, beat the heavy cream until peaks form. Set that aside and in another bowl, beat together the peanut butter and cream cheese on medium speed until creamy and combined. Beat in the sugar until combined. Beat in the vanilla extract and salt until the mixture is fluffy, about 2 to 3 minutes. Take the whipped cream and fold it into the peanut butter mixture until it is smooth and the no whipped cream streaks remain. Before serving, make the marshmallow. Combine the egg whites, sugar and cream of tartar in the bowl of your KitchenAid Stand Mixer. Place it over top of a double-boiler that contains simmering water, and whisk constantly for 3 to 4 minutes until the sugar has dissolved and the egg whites are slightly warm. Immediately remove the bowl and place it on your stand mixer with the whisk attachment, beating slow at first and gradually increasing the speed to high. Beat for 6 to 7 minutes until glossy and thick, then beat in vanilla extract for another minute until combined. Pile the marshmallow on top of the pie. Sprinkle with peanuts and serve! I love peanut butter pie! I make mine with an oreo cookie crust or a nutter butter crust. Its the best. Ahh this looks amazing!! I’ve never done a topping like this before… would you be able to make the whole pie ahead of time and store in the fridge, or is this a make and serve immediately? Oh my goodness! Adding this to my thanksgiving menu right now! Been looking for a somewhat easy yet unique pie recipe to make for Thursday… this may be it! Thank you! Just a little typo I think – “…that my grandmother made when I was a crust”. Though it did make me smile! Ha ha! Please don’t change it! It filled me with joy. The pie looks super yummy. What is not to like when thee is peanut butter and real whipped cream involved. I have to say, I am not a fan of the blue mixer…not a fan of blue generally. I did become super envious of your beautiful brushed copper KitchenAid and finally broke down and purchased one when they the mini size in that color was introduced. I adore it…it looks lie kitchen jewelry on my counter. Now I wish for a fancier bowl to complement it. Did you do something to toast the top marshmallow later too? To make it slightly brown? Looks amazing! It’s so sweet to see you speak of Mother Lovett again, I’ve been reading your blog for a while and remember when you would post more frequently about her. 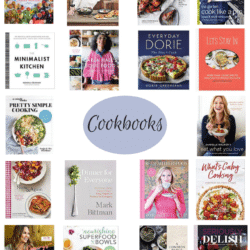 Some of my best recipes are Mother Lovett’s, those snickerdoodles are my family’s favorite. Recipe question- would all natural/sugar free peanut butter work here? This looks delicious! Looks amazing! Can anyone tell me where/how the extra egg white in the crust is used? 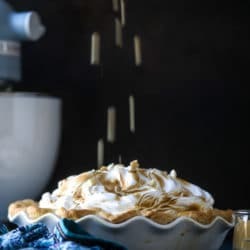 I think it is so special to use Mother Lovett’s peanut butter pie for this post. I’ve never made peanut butter pie, but I am going to make this one. The crust and topping sound perfect! I love the blue Kitchen Aid mixer! I just bought my first standing Kitchen Aid mixer this summer! Love it! Hope they are around for another 100 years! You are certainly leaving a legacy of recipes for your children! I made this on Thanksgiving. The crust and peanut butter part was DELICIOUS. The marshmallow topping failed hard though. I followed the directions to a T and the eggs and sugar never thickened in the stand mixture after the double-boiler. I beat it on high for 8 minutes and it looked exactly the same! So I ended up adding heavy cream to get it at least like a whipped cream. It was runny but OK. If I made again I would just not do the topping. It was still a hit though! I made this this weekend. I made the crust using my food processor and it turned out really well. Although, it calls for an egg white in the crust that is not used in the instructions below. I had similar issues with the marshmallow topping that Hannah did – it took a reallyyyy long time to even form weak peaks, but it eventually got there (mostly) however it was nowhere near as stiff as whipped cream. On the plus side, it tasted exactly like fresh marshmallows. I found the pie in all incredibly rich. Very good, but i’m not sure how anyone would have more than 1 small piece. In that way, it is perfect for a large group! Finally, for anyone else trying to get the topping to toast without a blow torch, I chilled my pie overnight, and then froze it for about 6 hours. Then, i put it in a preheated oven at 425 (this was the max temp for my pie dish) and toasted it for about 8 minutes. I wish the topping had gotten a little more toasted, but the pie was the perfect temperature after 8 minutes, so i think that was a happy medium. this is the most delicious PB pie. I can’t stand how good it was!